Commissioner, Ministry of Environment and Natural Rsources (MENR), Shehu Balarabe Giwa has reiterated the commitment of the State government to make Kaduna State cleanest across the country. 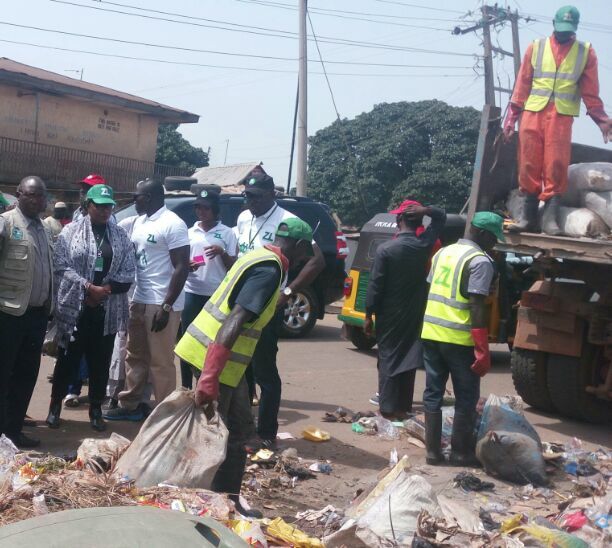 This was as the residents of the state are been sensitized ahead of monthly due between N200 and N3,000 for waste collection and disposal. Speaking to newsmen shortly after taking assessment tour of ongoing construction of dump sites and transfer stations in Kaduna on Tuesday, Managing Director of ZL Global Alliance, Abiola Bashorun said, her company has been given the approval by Governor Nasir El-Rufai, to collect the levy and remit same into government purse for the smooth running of the programme. According to her, business of managing waste is never an easy task. It is capital intensive especially at the initial stage, quickly added that the rate of waste been generated in the state is extremely high when compared to other bigger states hence the need for strategic intervention to meet up with the challenge. Some of the waste collectors spoken to by Gobroadsheet identified irregular salaries, insecurity and indiscriminate dumping of refuse by the residents especially those in the market as major challenges they face in the course of their duty. Responding to these challenges, the MD ZL Global Alliance said the state government has resolved some of them “we are meant to be paid every 30 days so we can also pay our staff as when due. The last time we were paid was in July which may be due to bureaucracy and we quite appreciate those working with us for their understanding in this regard. “We are going to begin the second phase now. We are going to be collecting due from house to house. It has been approved and we are the only company that has the legitimate right to do that across the state. This will help bankers to give us loan facility. So when we start, we will not be demanding money from government again to manage waste. The levy will be based on property, location and income cadre. For example, people in GRA with the biggest house will be paying N3,000 while places where we have low income earners will be levied as low as N200 monthly. Earlier, Commissioner said the state government is taking step to address the issue of security at some of the waste facilities, adding that the residents may equally make enough money from waste they generate to augment the monthly levy that will be introduced for effective management of waste in the state. According to him, when the three dump sites and 10 transfer stations currently under construction are completed, it will make the state one of the best in terms of environmental friendliness across the country. “When the three dump sites in each senatorial zone and 10 transfer stations; six in Kaduna, three in Zaria and one in Kafanchan are completed, our state will be the cleanest which is the first stage. The second stage is where we will begin recycling. Then, we will be transforming waste to wealth. For example, we we be recycling both organic and inorganic fertilizer, industrial materials, energy and what have you. It is at this second state that we will be making real wealth because we can now recycle the waste for industrial and agricultural raw materials. ”All these plans however are two side if the coin. While government is trying to make the state better, residents who are beneficiaries should play their own role. We can have the state we all dream of. It is possible if all of us can cooperate with government by carefully dispose our waste, we will all be better for it”, added the commissioner. Areas visited by combined team of MENR, Kaduna State Environmental Protection Authority (KEPA) and ZL Global Alliance include Ngwan Rimi, Malali, Kawo, Mando, Buruku and terminated at Ahmadu Bello Way all with Kaduna metropolis.